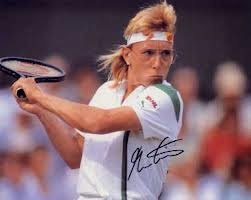 Billie Jean King, former World Number One women's tennis player, said of Martina Navratilova, "She is the greatest singles, doubles and mixed doubles player who has ever lived." Martina's list of championships is way too long for me to include in this post. Suffice it to say, Billie Jean King wasn't kidding. At the beginning of her career, I'll guess that to be 1980 or 1981, I happened to see Martina on the David Letterman Show. The day before the Letterman interview, she won a championship in Texas. Immediately afterwards, she flew to New York to tape the show. The morning of the Letterman show, she got up early and practiced two hours before she taped the interview. At some point during the interview, Letterman asked, "Martina, when did you realize that you could become a tennis champion?" She settled back in her chair, considered the question like it was an opponent's serve, smiled, and then said, "When I was young, maybe five or six years old, I realized that I was good. When I got that, really got it, I began to wonder how good I could be if I worked hard to develop my talent. And that's what I've done." The two steps taken by the woman who became the best ever in tennis could be equally applied to writers with, I'm sure, the same results. 1. Discover your talent and own it. 2. Work tirelessly to develop your talent. If you do that, then one day John Grisham or J.K. Rowling will say of you, "(insert your name) is the greatest novelist who has ever lived." If you think that is impossible, it is. If you like the sound of it and are willing to work tirelessly to develop your talent, then you should expect the impossible. Remember, #1. and #2. come before agents, publishers, queries, book covers, book descriptions, social media, marketing, branding, reviews - before everything else.